Corpus Compendium: Announcing Optimum Apex! That's right, folks - Corpus Compendium is now in the supplement game. We couldn't be happier to announce our first product, Optimum Apex. Who? All Corpus Compendium. Optimum Apex is designed by yours truly and manufactured directly by a major chemical lab in accordance with my formulation and FDA Good Manufacturing Practices (no worries about this product being hand-mixed in my basement). Every batch's purity is assured via a certificate of analysis, guaranteeing quality control and a homogeneous mixture. What? 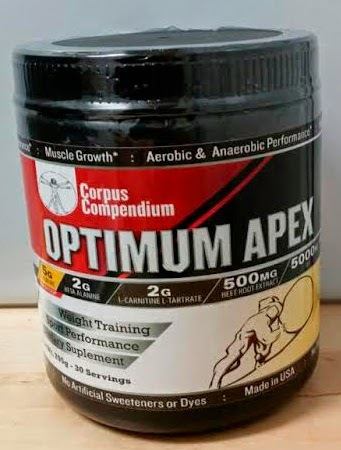 Optimum Apex is a performance supplement that increases anaerobic and aerobic power and endurance. It also assists in the growth of lean muscle mass, helps attenuate muscle loss from hard training, and aids in recovery. Most importantly, it also helps optimize hormone profile, which is absolutely critical for all aspects of performance and general health. ...and nothing else. No filler, no proprietary blends, no pixie-dusting tiny amounts of active ingredients. You get full doses of the 5 safest, most effective performance supplements out there, period. Of course, this is just a cursory explanation. For a real look under the hood, stay tuned for a nitty-gritty write up, full of my usual science talk and unnecessary levels of depth. When? The first 500 ships this week. As soon as I get it, you can get it too. Where? Amazon, Ebay, and direct from this site via Paypal. Why? The supplement industry is a dirty, slimy, scary game. In short, this is me shoveling against the tides of snake oil. After reviewing countless supplement studies and constantly battling the rampant misinformation, I simply decided we could offer something better. Much better. I need more info before I send you all my money! It wouldn't be a Corpus Compendium product if I didn't offer you way, way more information that you could possibly want or care about. This is just a first glance. Keep an eye out for full details once the product is ready to sell! This is an extremely exciting time for us, and we again want to mention all the readers who have supported Corpus Compendium thus far. We quite literally made this product for you.